Really loved this apartment- though it may have proved noisy but it was perfectly peacful. Very stylish and the pictures on your wesite were accurate and did not mislead. 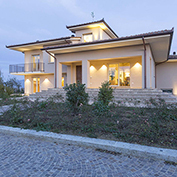 Also very spacious and positioned right in the centre of beautiful Cortona. I liked the fact that it had all the washing up liquid/dishwasher powder etc- you often end up buying all of this - bit of a boring purchase and mostly wasted on a weeks visit. Also the welcome pack you prepared was excellent! We really felt as if we were in good hands with our booking.